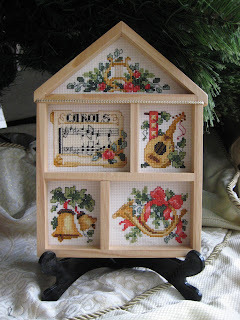 These are from Cross Stitcher mag issue 247, the cover kit. I won't go into long details about how much this magazine has disappointed me this last year (again!) but they slightly redeemed themselves with these designs by Angela Poole. 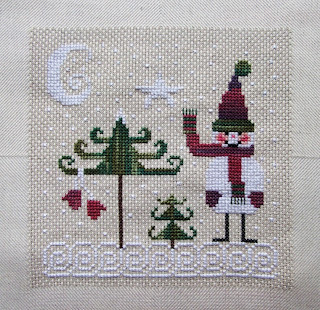 But why oh why supply aida for designs with so many fractionals and backstitch splitting the squares? Why? Why? Why? Only the tree was suitable for aida stitching which made it a little bit of an odd-man-out in the set. And here they are, all scrapbooked up! The hand-made card is from my SIL and the little fireplace has four stockings with our names on, isn't it cute? Why do I have a kitchen TUSAL? Because I also stitch in the kitchen while waiting for the tea to heat up. (I don't do cooking as such, well, not much if I can help it!). The huge candle has come out every Christmas since we've been in this house and burned throughout Christmas dinner. At this rate it will see me out and probably the large boy and his descendants too! The small festive thingies sit at each of our places during the meal too. This is Part 1 of a cute little Christmas design by Jenn of Leftsox. I have Part 2 now currently being stitched on some gorgeous green evenweave courtesy of Mouse House Emergency Fabric Supplies. Thanks, Mouse, I owe you one! Finally, who can identify the item my kitchen ORTS live in? The main TUSAL was a jar of sweet and sour sauce in a previous life. I thought about using a Branston Pickle jar for the English connection but was concerned my ORTS and therefore my ornie would smell of old pickle for evermore! On that note, have a wonderful Old Year's Night and a magical New Year's Day. The final Happy Dance for 2012 is the Star SAL from Periphaeria. I became aware of this one about halfway through on Mouse's blog and just had to join in. 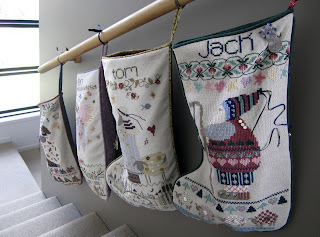 I also filched the colour scheme from Mouse, she used purples on another sampler and they looked so good I had to steal! The fabric is Purpleberry Spludge from Sparklies, gorgeous name for a gorgeous fabric. 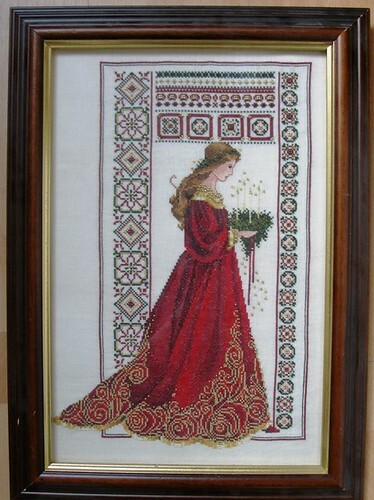 It's a 28count evenweave which I stitched over 1. I've used Purple 333 and Yellow 973 throughout but the purple looks lighter when there's only one row of stitches, on the alphabet and the bottom symbol. I'm going to get an A4 frame to show off the fabric. After payday, so it'll be a little while! The International Mail part of this post refers to the three packages I received today. Yes, three international parcels, Hubby and the postman must think I am an international jewel thief or something! 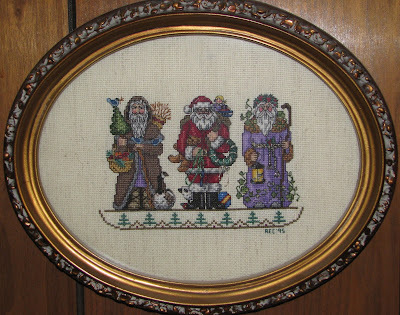 The first one is a prize from Shirlee of Farmhouse Ponderings. She had a Giveaway and I got a runners-up prize of these cute pins. Sweet, aren't they?﻿ I haven't used pins before but I'm sure I'll find a good way next year. The second package came all the way from Cucki-land. Isn't it just so sweet and Cucki-like? I saw a post on her blog where she said she loved material bags. The bookshop where I work has a nice selection including one with a Quentin Blake design on I thought she'd like. When I bought it I found a donation from the sale goes to a Book Charity in Africa which seemed appropriate. So off it went to South Africa with some bookplates which match a picture on her blog. I have had the bookplates since 2 surnames ago and had a few left. They have a Maloo style cat looking at a pile of books! What a lovely selection of cards, bookmarks, wooden ornaments and a little letter. The only thing that gave me a fright was the black tassle. Why? Well you imagine opening a letter from South Africa and the first thing you see is something black moving!! It's a very small African Spider was my first thought!! Luckily it wasn't. The final package was some threads from Janie (no blog). She's a friend from the Yuku boards who loves Joan Elliott. Unfortunately it is difficult to get the UK magazines where she lives so I sent her the recent pullout chart of the Madonna and Child design and she sent me some DMC in exchange. Bearing in mind that DMC costs 90p a skein in the shops here or 40-65p online this was a good deal for us both! I just had to include the photo as the colours look so lovely together! 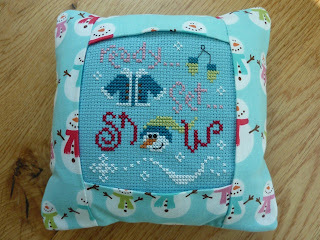 I don't want to put them in my floss bags just yet, they really need to be stitched into a sampler first! I didn't ask for any particular colour because I have less than one skein of any colour so anything is a bonus frankly! 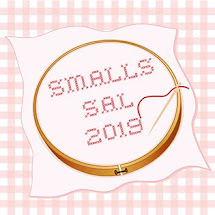 And finally, when I went to Sparklies' website to get the link, I saw that she's having a New Year Sale on 1st January for 24 hours GMT only. So get over there if you want 20% off her lovely fabrics. Here's a little something I stitched up over Christmas. It's a new design from Gazette 94 (aka Claire). 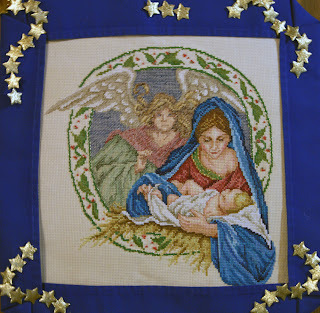 She has taken a break from blogging but did gift her followers with two new designs for Christmas. 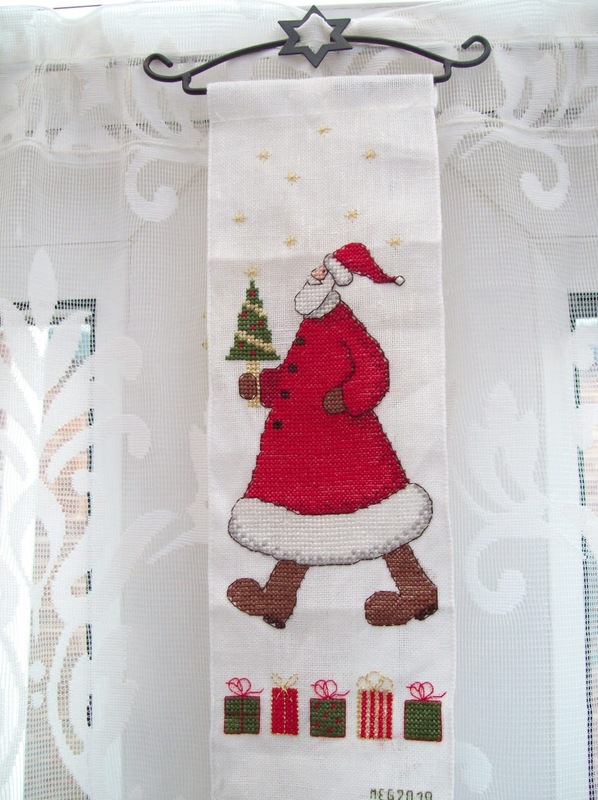 I used another piece of the tea dyed evenweave and some Christmassy DMC colours chosen by me. I think the two reds are a little close in colour, maybe I should have used 815 instead of 304 but there you go! 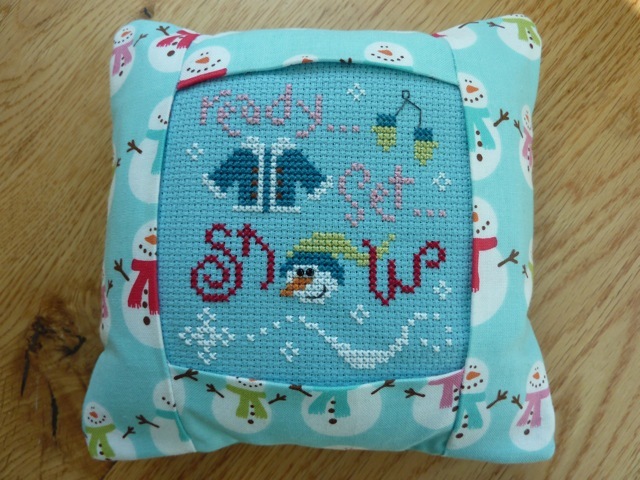 The finished piece is resting on a page from one of my Christmas presents, a scrapbook. This is a proper scrapbooker's scrapbook not just one for any old cutting-and-sticking! It comes with an extendable spine and lots of pocket that you slot the pages into. You can either buy the pages individually or in a cardstock block. These are about £20 but you get loads and they are gorgeous. I've bought half a dozen Christmas themed papers so far. Some are double sided which is good. This is the actual scrapbook, there is a place in the cover for a picture but I don't think a piece of fabric will fit it so I may take a photo of something suitable, maybe my Stitching Friends ornie. The cover is black fabric with white embroidery, very appropriate. Hubby paid for it but the large boy chose the design. I also got a great Page-a-Day calendar from my brother, there's a different chart every two days and they're really rather good. He also got me a CD-Rom with card designs on, and 101 Joan Elliott smalls! How fab is that? I used the money from my in-laws to fund some of my pre-Christmas stash shopping. I bought some Just Nan charts and a Drawn Thread one, plus the fabric for my Joan Elliott Round Robin and the Mary Wigham FB SAL. I did order JE's Bewitching book from MIL but it's out of stock waiting for deliveries. Drat! 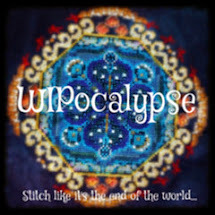 As well as the TUSAL, the WIPocalypse, the Theme-a-licious, the RR, the FB SAL and my own "12 in '12"; I have also signed up for a Birthday Thread Exchange on the Needlecraft Haven Forum. I have to send each member a card and a certain skein of thread on her Birthday. In return I will get several cards and skeins on my own which will enable me to stitch the chart Claire has chosen. The first Birthday is 1st January. Eeek! Not much stitching time there! Claire says non-crafted cards are fine but I wanted to start as I mean to go on. So I spent Boxing Day stitching a nice design from WOCS. I will reveal once the Birthday Gal has received it! Finally, I know you all had great Christmasses because I've been trying to keep up with your blogs. People actually posted on Christmas Day itself! Hubby put the laptop away in a safe place so we had no pooter-time at all that day. I've got over 300 blog posts to read so I'm doing my best to catch up. If I do make a comment then you are extremely priviliged! Thanks for all the comments on my blog, I do reply to quite a few where needed but some people don't have an email linked so I can't. Susan, I'm thinking of you! Thanks for all the comments you leave, I do enjoy them all. Nia of Caixinha de Pirlimpimpin has been posting each day with her 12 Days of Christmas. She asked everyone to comment on each day and make a post of their own. I have managed to comment on each post but that's it so far! So here's recap with the Lazy Blogger's Way of simply copying the comments I made on each day. Hey it's my blog I can do it if I want to hahaha. 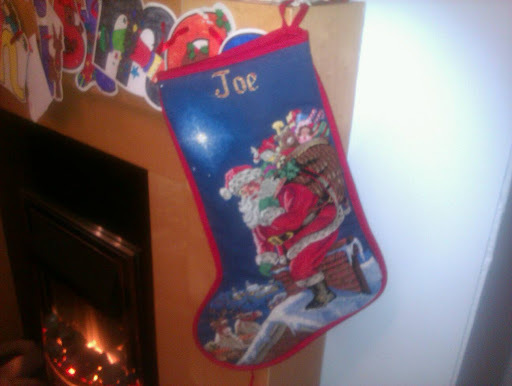 Our little stocking tradition is that Santa puts a comic in the top. The children cannot come and wake the parents until they have read their comic. My parents started this tradition with me and my siblings and I have continued it with my boys. The boys' stockings. I did not stitch these, in case you were wondering. My Mum ordered them from a company in Cornwall. The small boy's was a special request as they put a limit of 10 letters for a name! I wish I did do fancier wrapping but with children it's not really worth it! I do make sure I use different wrapping paper for each person who is sending the present. My family give me money to buy my boys' presents so I use different paper for each different Auntie. I also make sure Santa's presents come in a totally different paper too! The fence is an anti-small boy fence to keep him away from the TV, audio system, wood burner, my stitching and the presents!! I love all the different wreaths, the balls of wool are great. I have an artificial one which comes out every year. I decorated it myself with red baubles and ribbons many years ago. MIL comes and cuts our leylandii to use to make a wreath for her late husband and her parents' graves. Just in case you wondered!! Calories! I love them, I'm very slim and need to keep warm in the winter. We have a traditional English Christmas Pudding on Christmas Day. We pour a tablespoon of brandy over the top of it and set light to it, it burns a beautiful blue flame. Mum usually does the pouring so she gets to lick the spoon! She also chooses the portion of pudding with the most brandy spilled on it! MIL's speciality is Sherry Trifle and the whole family love it. We also HAVE to have the following sweets at Christmas - After Eight Mints, Orange and Lemon Jelly Slices, Matchmakers, Turkish Delight (in sugar not chocolate), Chocolate coins and hubby has a giant Tobelerone too. Just one of the Large Boy's presents. Is it a biscuit or is it a cake? He's got 60 chances to decide! Random Angel to show scale. I don't usually keep her on the radiator! Christmas Pudding, Plum Pudding, Figgy Pudding, call it what you will, it's delicious with brandy and custard! Please excuse the elegant sippy cup in the picture! The small boy is not allowed the posh crystal yet. 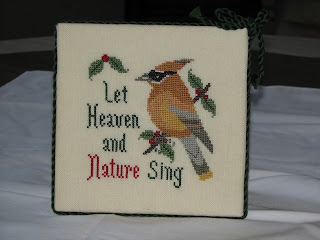 I don't have many cross-stitched ornaments as I don't enjoy the finishing process. 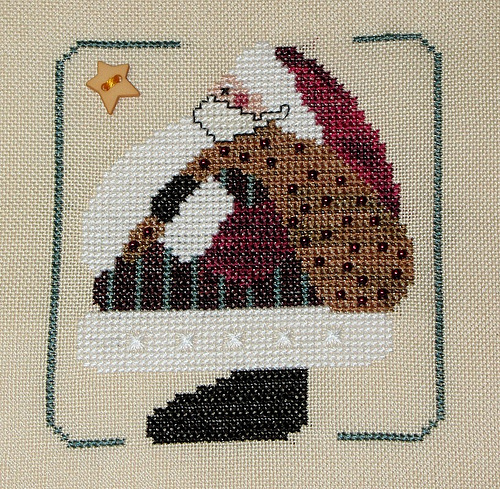 I do have a lovely stitched snowman Shannon sent me this year and some red/gold framed in small hoops from several years ago. I suppose my Angel Collection is my Christmas ornamenting. 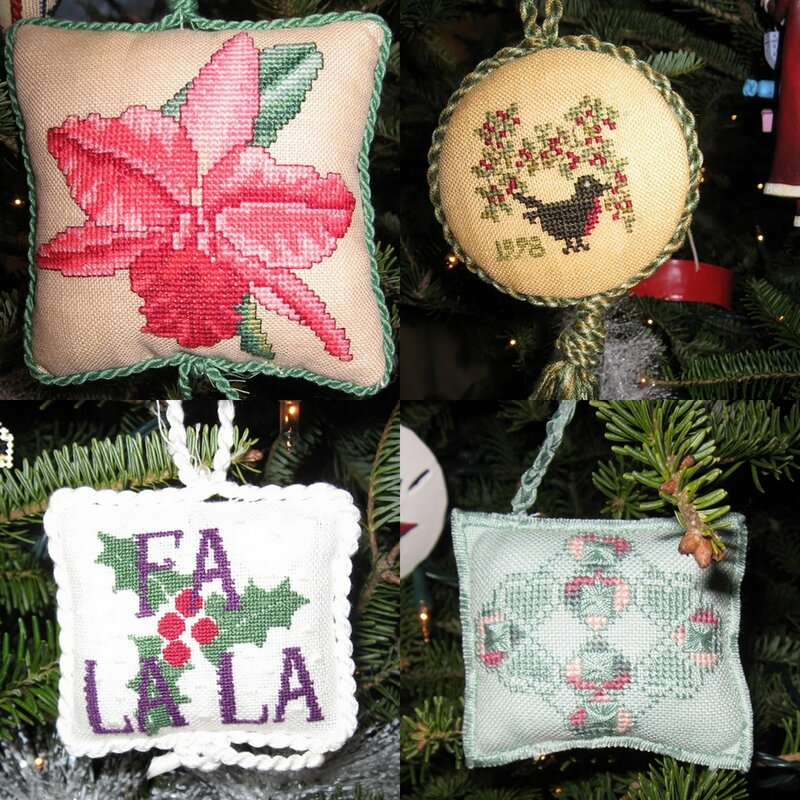 I have stitched several of the Mirabilia and L&L freebies over the years and get them all out for Christmas. We've had a real once since we've had a room big enough. It sits next to the wood burner and gets fed straight into it after Christmas is over! I love decorating the tree with all the things I've collected over the years, all in red, silver, gold and crystal - very classy! I have snowflakes on my blog! As chosen by my son AKA the large boy. We have snowstickers on our patio doors. This time last year we had real snow but so far only a little sleet and some frost. 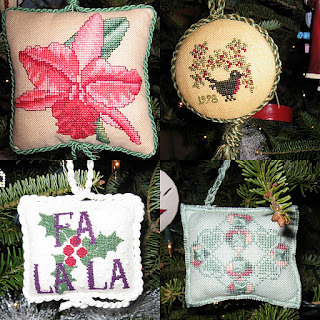 I actually have the free felt baubles in Nia's picture but only stitched half of one. They provided cheap aida and imitation threads then expected you to do alot of fractional stitches! 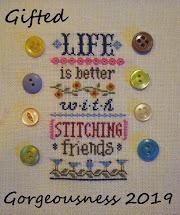 There was barely enough thread to stitch one let alone all three as they claimed! This magazine is on it's Last Chance. I negotiated them down on the subs DD and will give it to the end of the Emily Peacock alphabet to improve! We made a gingerbread house once from a kit. There must have been some fierce additives in the sweets as my son got totally hyper and was bouncing off the walls! In answer to Joysze, legs first, then arms, body and head finally! Her question was - how do you eat your's!! We call it "kiss-eltoe" because that's what you do under it! We haven't actually got any in the house, every time hubby and I try to have a quick kiss there will be a small boy (or two) pushing between us. And Joysze, there is no chance of a snog at all!! No pictures of mistletoe, so here are some cards instead. 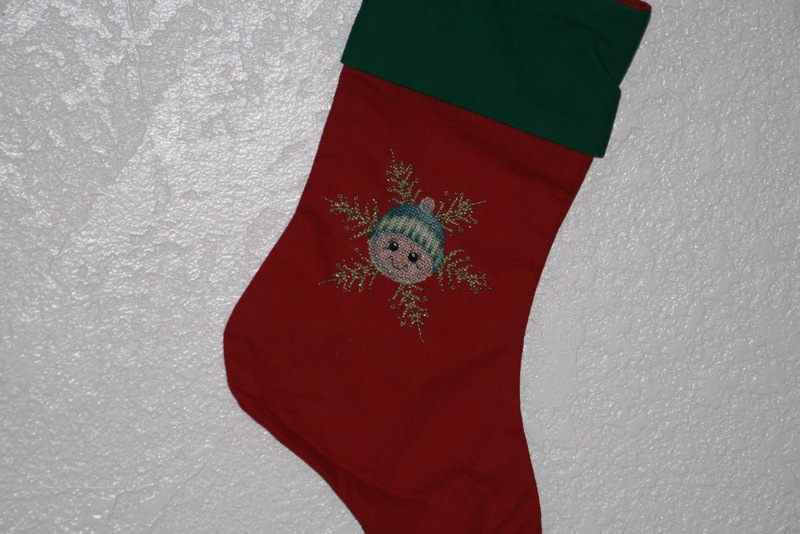 (Isn't the little stocking cute?) The design is one of my own. And this is from WOCS too, we changed the colours so it looks more like my son's "pet" guinea-pig. I love taking photos. My best Christmas present was a digital camera. The luxury of being able to check the photo after taking it and retaking it if it's not good enough! I wait until I have 200 on the camera then print them off because it is cheaper for more than 200! I love my photo albums too, all labelled with the person's name and the date too. This is the Small Boy modelling the bootees he got for Christmas when he was minus 6 weeks old! Yes, that is a very large baby bump, he was 10lbs at birth so probably weighed 7lbs in this picture! Do you say Santa or Father Christmas? Or St. Nicholas? I used to always say Father Christmas but Santa is much easier to type! We leave him a mince pie and something to drink on the hearth on a special plate you can write a message on. Rudolph gets a carrot too. A little blurry as it's a close up from a bigger picture, but here is Madame Muriel surrounded by men! She is looking forward to spending Christmas with us and will update her adventures after a nice sweet sherry. Thank you to Nia for thinking of all the fun themes for each day, hope you enjoy mine. Sorry I couldn't find pictures for each day. Frankly I did well to keep up with the posting. I have 250 blogs to read now before hubby closes the computer for tomorrow. eeek! 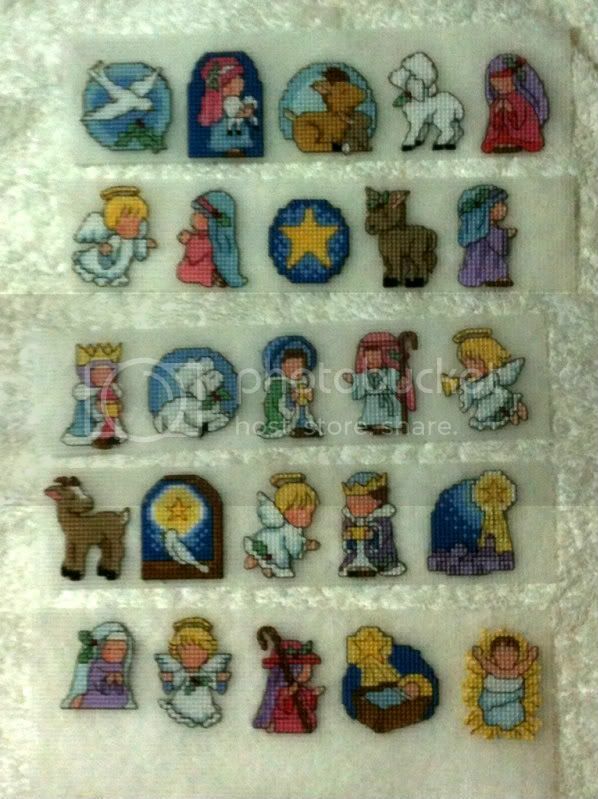 I promise to update my advent calendar before then. 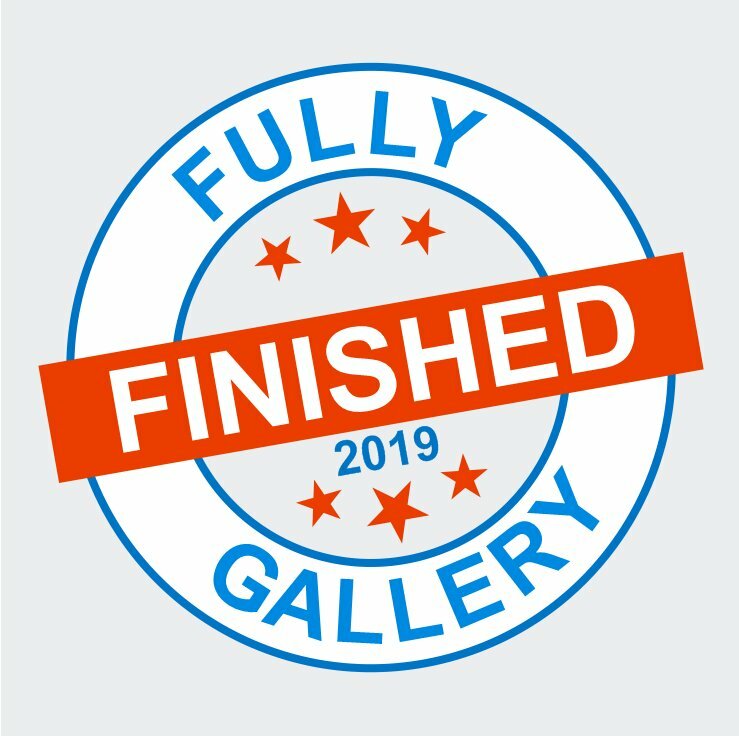 The Calendar is complete, every door is open, every picture posted. Thank you so much to everyone who joined in the fun. Pop over to each blog to see how they celebrate this time of year.